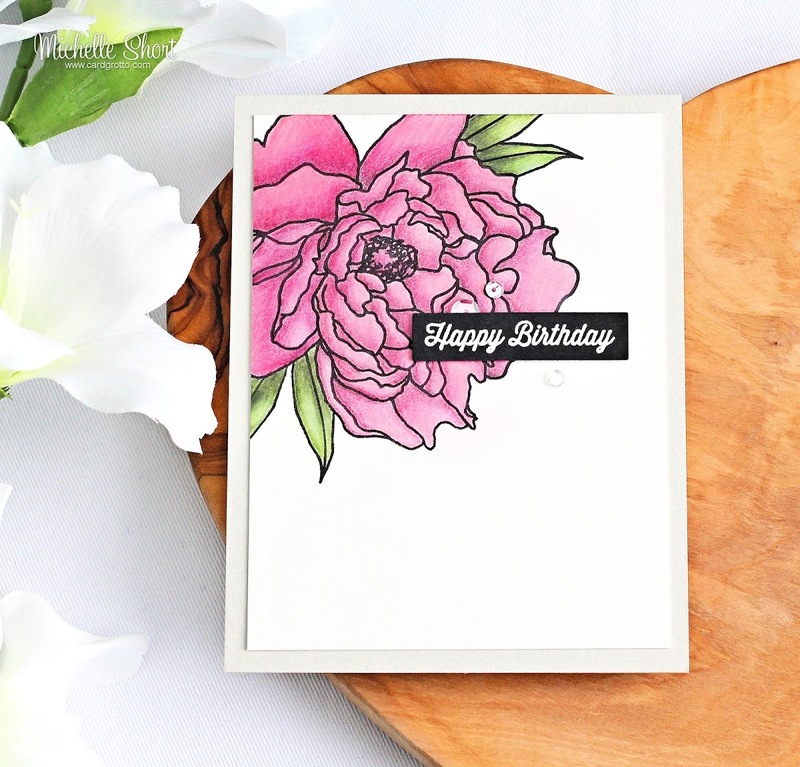 Hello there, today I have a card to share using the new Peonies Stamp Set from Hero Arts. I am in love with all the new florals that they have brought out, perfect for colouring! 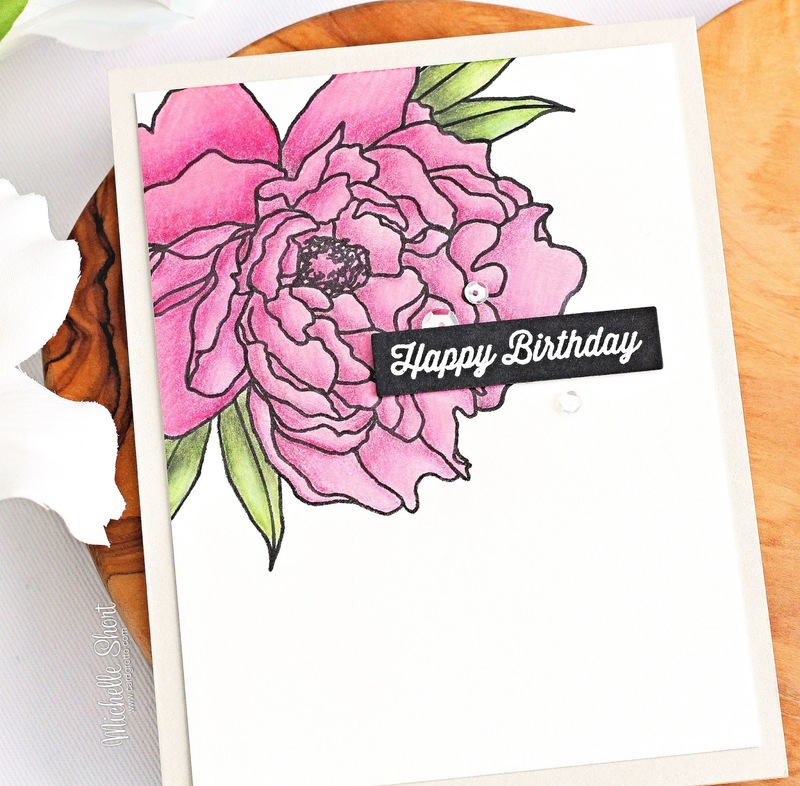 I started off by stamping the large peony image using black ink on to Fabriano Artistico watercolour paper. I then did a light wash of Daniel Smith Quinacridone Rose watercolour to the petals and Undersea Green to the leaves. Once dry, I coloured the peony with colored pencils. I used mainly Polychromos and then added some white highlights with a Caran d'Ache Luminance white pencil. 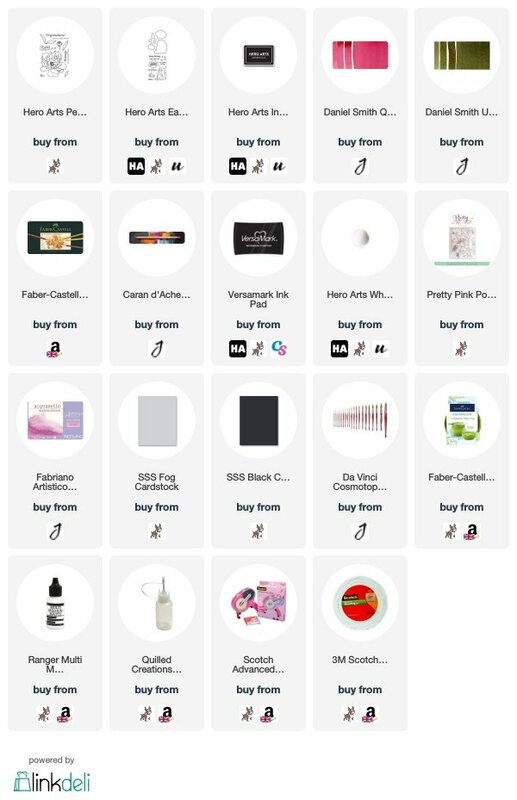 The colours I used are listed below the supplies section. The image panel was then cut down to 5.25" x 4" and added to a Fog card base with ATG. I took the 'happy birthday' sentiment from the Eat Cake All Day Stamp & Cut and stamped this on to black cardstock using Versamark Ink. I applied white embossing powder and heat set. This was then cut in to a strip and added to the card with foam tape. To finish off, I added a few Sparkling Clear sequins. COLOUR PENCILS: Flower petals - Polychromos 199, 133, 125, 129, Luminance 001 White. Leaves - Polychromos 199, 174, 168, Luminance 001 White. Unfortunately the photos aren't quite doing the colouring justice but I think the watercolour helped to give a base to the colour pencils. Thank you so much for visiting me today. I hope you have a great rest of the weekend! Beautiful card Michelle, I love how you used a combination of media. Very nice card! I love the peony! !